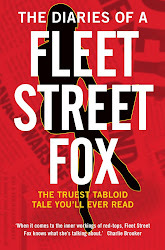 fleet street fox: Good news for some. A FREELANCE friend told me last week about trying to sell a story to a national newspaper. "I rang them up," he said, "and it was like talking to someone who'd just been in a car accident." On the one hand, journos will always complain newsdesks aren't treating their stories with the Watergate-shattering respect they deserve. And on the other he had a point. The combination of phone-hacking and corruption scandals, a public inquiry and three police investigations are having a serious effect on even those of us who are not under suspicion. If you open a national newspaper today, you'll have to look hard to find a story that hasn't come from a press office, showbiz agent or what's known as a 'buy-up' - when someone comes to us for a full sit-down chat and a cheque. Today The Scum splashed on a buy-up with the mum of a £45m lottery winner. The Daily Glimmer went with a story from the wires about a baby killed in an American tornado, the Wail with information from an FOI request, The Groaner's done Russia, The Tims did the opinion of a Falklands War vet and the Wellygraph led with a behind-the-scenes briefing from our beloved Chancellor Gideon. They're are all perfectly reasonable stories, got in perfectly reasonable ways. On a Monday papers have less news in than the rest of the week because they were prepared on Sunday when there's very little going on, and without the Screws (RIP) setting the agenda there's less material for the dailies to mop up. But I've sat and read all of today's papers and I can't for the life of me see a story about crime, politics or health that hasn't been officially approved in some respect. Critics will say this just goes to show that all such yarns were got via criminal means, and now the guilty parties are so scared of being caught they've cleaned up their act. But a more realistic person will wonder whether all newspapers would have had the budgets to pay a bung or hack a phone on every story, never mind the inclination. In my experience the vast majority of tales come from somebody telling someone else something for free, as a bit of gossip, sometimes with and sometimes without realising that information would be passed on to a journalist. I've known celebrities who tell their friends things on the clear understanding it will end up in print, and I've known stories which came about because someone sat and gossipped to their hairdresser, who in turn repeated it to the next client who just happened to be the wife of a journo having her roots done. Coppers I've dealt with over the years generally tell you stuff for free, for exactly the same reasons that celebrities, politicians and showbiz PRs do - because it makes someone look good. A good journo takes such briefings with a pinch of salt, but listens to them all the same. Vanity works harder than money does. The scrutiny the Press is under is fair enough. Criminals need to be investigated and held to account, whatever business they're in. But the timing of an inquiry being held before the criminal cases which sparked it, the investigations which are being dragged out over years, is leading to what can only be called a story crunch - just like an economic recession, only with a lack of public information. Without a single criminal case being heard or conviction won, journalism has become a trade where the phone has stopped ringing. A copper on a case who thinks his superiors have screwed it up is not going to take the risk of a quiet word in a journo's ear. A soldier who has had to spend thousands of pounds buying his own kit isn't going to get his mum to ring a newspaper on his behalf. A teaching assistant, council clerk, librarian, prison officer, dustman or anyone else employed on a public wage is going to be terrified of losing their job if they flog a tip for £50 - and it's tips which are often the first step on the story ladder, which allow an investment of time and effort to build up to a really good scandal. Do you think politicians have stopped lying? Do you believe prisoners are all being well-behaved, that celebrities have turned their backs on drugs and hookers, doctors have stopped making mistakes, or that the courts only jail the guilty and let the innocent walk free? Those stories are still happening. We just aren't hearing about it. And if they're scared, then so are we. Hacks worry every phone call and email could be handed over to the police, that papers won't protect the sources we work hard to reassure, that so much as buying a pint for a CPS lawyer after court will see everyone involved collared by a police force under pressure to compensate for its previous mistakes. We err on the side of extreme caution rather than take a risk. Which of course is good news for some. Particularly if you're in charge of a government overseeing controversial changes to the criminal justice and welfare systems, sacking thousands and cutting benefits. It's good news too if you are one of the top bods in the Met Police, and want to tell other people what is and is not in the public interest without letting them make up their own minds. It's quite good if you're a publicist who can threaten cowed journalists, or a celebrity with a book or DVD to sell, and it's bloody brilliant if this time last year you were a Prime Minister facing difficult questions on how much you knew about the whole damn mess when you employed one of its central figures as your spin doctor. And it's more marvellous still if you are a lawyer acting for one of the truly guilty individuals who not only corrupted others but became corrupt themselves, who twisted my trade and abused their position for their own gain. Because not only is there a bucketload of billable hours in this, when it finally comes to court your client will walk. I do not want news that has been approved by a press officer, run past the police or checked against Hugh Grant's moral compass first. I want my news back - cleaned of criminality and paying off its debts but just as badly-behaved and mischievous as it ever was, kicking over the dustbins, cocking a snook and scribbling away frantically because it had a really, really good story to tell. Scrutiny stills the hand, even if it's not a guilty hand.